It was recommended by a dear friend whom I love and completely respect all their book recommendations, so I was keen to get stuck in. I knew it would offer me insight into the ever present distractions of daily life. I was also looking for new resources to get stuck into a more focussed ‘deep work’ for those projects that seem to keep slipping from my grasp and attention. The book is neatly split into two parts, Part 1 The Idea, Part 2 The Rules. Already I’m turned off by the notion that there will be ‘rules’, such is my anarchy. Procrastination challenge 1, how do you get a rebel-hearted-creative-freedom-seeking-individual to get excited about ‘rules’? Back to justification for the book. The core aspects behind Part 1 being; work is valuable, work is rare, work is meaningful. Newport makes a good argument to suggest that it’s those that have been able to cultivate a way of incorporating deep work into their lives that are set to succeed and it’s needed now more than ever given the way our cultures are changing through rapid technology development. There’s plenty (like far too much for me) of evidence to prove the point. His stories and anecdotes are wide and far reaching in terms of their variety and diversity so whilst there may be a lot of it, there’s definitely something for everyone. So if like me, you’re on board with the what and the why, maybe shimmy straight to Part 2 and get stuck into the how. This part of the book is again neatly packaged into four HOW’s; Work deeply, Embrace boredom, Quit social media (is it physically possible without needing a doctors note? ), and finally Drain the shallows. I enjoyed these sections way more than Part 1. It’s not only chock full of practical suggestions but also covers all your best resistance/procrastination techniques (believe me they all surfaced for me and I’m sure they will for you too). He’s sharp to convey that different people doing different types of work might need to work out which approach works best. He offers a variety of solutions for you to locate what might work best for you. There were five aspects to working deeply; deciding on your depth philosophy (shutting yourself away on a remote island isn’t an opportunity available to many after all), making a grand gesture (cue JK Rowling and how she booked herself into the Balmoral to write the last Harry Potter), don’t work alone (the need for both deep work and spontaneous collaboration), executing your deep work plan like a business and finally learning the value of rest and recovery for deep work. What I was struck most by in the book was the psychology. I’d studied Baumeister’s work before on decision-making reservoirs so I knew a little about this (although it’s easy to forget when shiny new things are distracting you). We have a limited amount of ability each day to make decisions and choices, training ourselves to focus on those decisions that matter first is helpful and why giving into that glass of wine at the end of is just a step too far for our already usurped will power reservoirs (after a long day of making lots of other decisions). He made a fascinating point about taking breaks from focus not distraction. 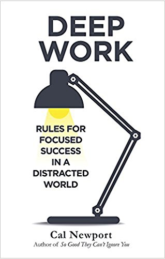 “When it comes to replacing distraction with focus, matters are not so simple.” Most of us looking to be more effective are focussing on trying to reduce our distractions but he suggests we should focus instead on focussed time and use distractions as a planned break from focus. Genius! Overall it was a solid rigorous book chock full of evidence and anecdotes and practical suggestions. I reflected a lot about whether the whole concept would work for me given my self employed-freedom loving-different timetable every week kind of schedule. My current conclusion was perhaps not… but perhaps my way of working is ready for a review. Having already reduced my distractions (drain the shallows he calls it) and limit my daily time on social media (thank you new iPhone app), I have been noticing I feel better, more relaxed, there’s more space, creativity, optimism and I have more time to do quality activities. I’ve even noticed the desire to look for another new hobby (shiny new thing???). If you’re someone who really struggles with concentrating, working more deeply on projects that matter or you’re just curious about different ways of working to get the most from your career, then this is a definite must read. If anything else it highlights the distractions and brings awareness to what’s working or not.